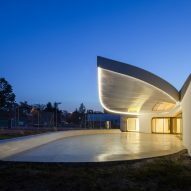 The flight path of a tennis ball informed the curving interior of this clubhouse in Strasbourg, which features dome-like skylights, a serpentine bar and brightly coloured floors. 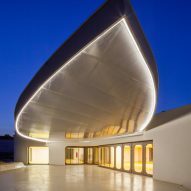 Local architects Paul Le Quernec rebuilt the centre to include a series of swooping forms that reference the movement of a tennis ball. 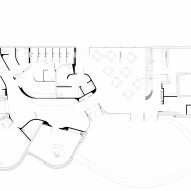 This resulted in a central pathway that curves around volumes with rounded walls. 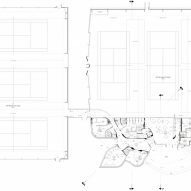 The Tennis Club includes changing rooms, a fitness room, an office, and a restaurant and bar, while a set of covered playing courts are placed at the rear. 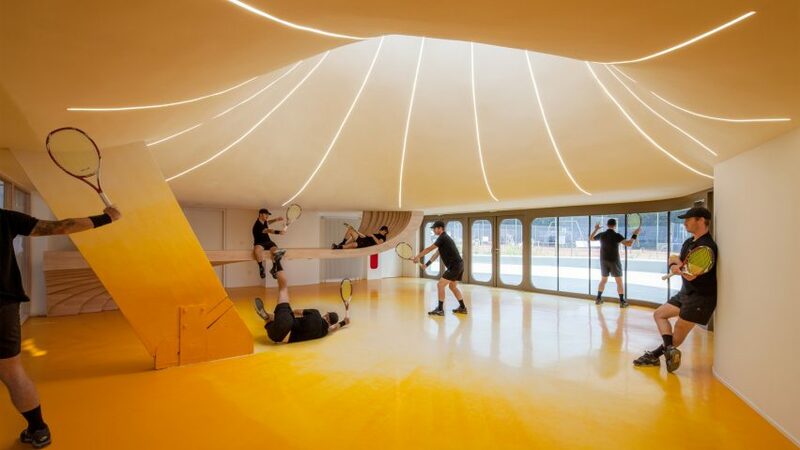 "This tennis club design is directly inspired by people flow in and through the building, considered as tennis ball dynamic trajectories, flowing from point to point, from function to function," studio founder Le Quernec told Dezeen. 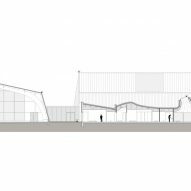 The white concrete walls of the corridor lead from the western entrance around a series of changing rooms to the playing courts on the northern side. 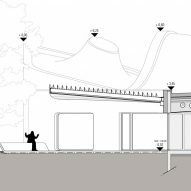 Another trajectory extends southwards, passing the clubhouse restaurant and onto the adjoining terrace. 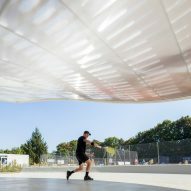 A large petal-shaped canopy extends from the building to cover a concrete patio of the same shape. 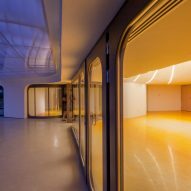 A bench following the outline of the patio faces the glass doors into the restaurant. 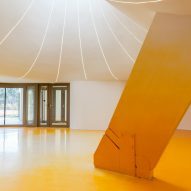 The architects introduced dome-shaped roofs to bring plenty of natural light into the space. 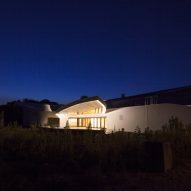 Thin light-filled slits emphasise the shape of the wells as they extend upwards. 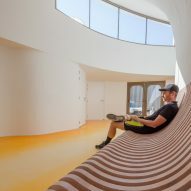 The floors below these natural spotlights are treated with beige resin, which changes into a deep orange towards the room's borders and corners. 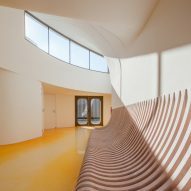 The intention of the rough gradient is to increase the day light effect. 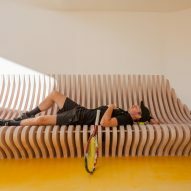 "The result is a kind of augmented reality, providing a feeling of sunny weather," the architect explained. 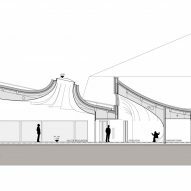 In the restaurant, a 7.5-metre-long bar made up of staggered slices of wood extends up from the floor on one side of the space and attaches to the ceiling on the other. 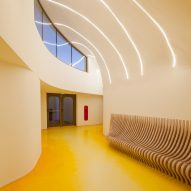 The bar is one of a number of custom-made pieces of wooden furniture for the project, which also includes a long bench that lines the corridor. 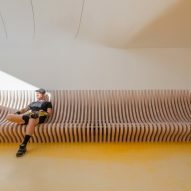 The bench is made from slats of wood and is placed beneath a large clerestory window. 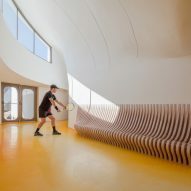 Curved white benches also wrap the changing rooms, while white tiles cover the floors. 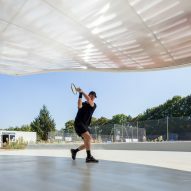 Other tennis facilities include an Amsterdam clubhouse by MVRDV featuring a seating bowl on its roof and a sports centre in western Poland by PL.architekci with a rooftop court.